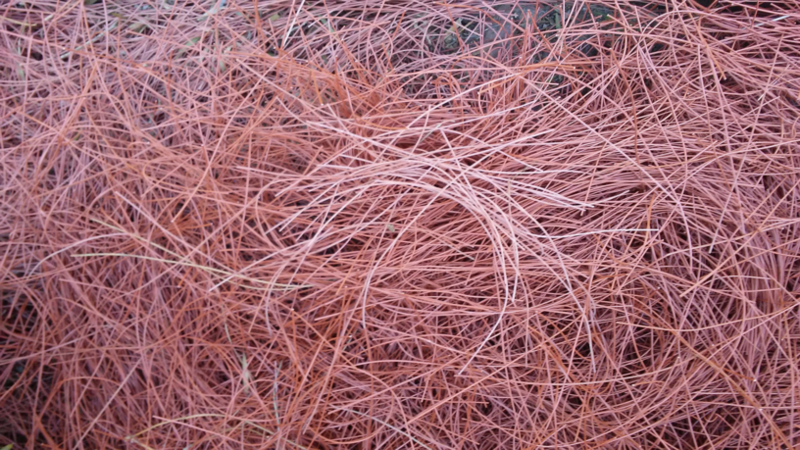 If your Textraw synthetic pine straw noticeably fades during the eight years after installation, or if another defect in materials or workmanship appears, Textraw, Inc. will provide the original owner with free replacement product equal in volume to the defective product. Installation labor and shipping, damage due to fire, flood or run-off, windstorm, improper placement in low-lying areas subject to flooding or run-off, excessive abuse and improper or lack of landscaping maintenance. This photo shows 20 strands of 13 year old Textraw shown in the center, sitting on new Textraw.